Prominent jurist and lifelong Democrat warns party is turning blind eye to 'anti-Semitic' hard left base. 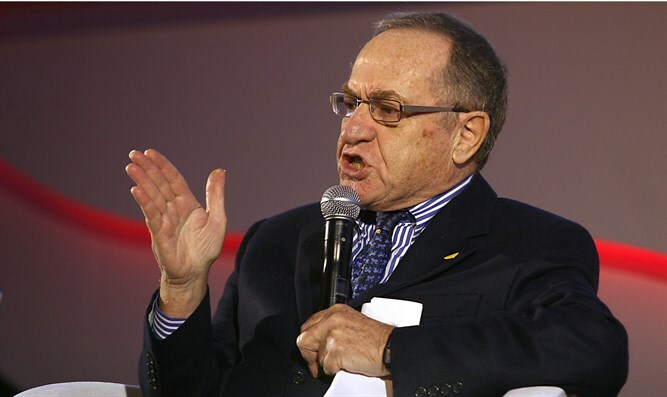 Former Harvard Law School professor and prominent jurist Alan Dershowitz chastised the Democratic Party over the weekend, accusing it of turning a blind eye to the growing anti-Semitism of the far-left. Referencing support for the anti-Israel Boycott, Divestment and Sanctions movement by some Democratic lawmakers, including Minnesota’s congresswoman-elect Ilhan Omar and the refusal of prominent Democrats like Democratic National Committee deputy chairman Keith Ellison to condemn Nation of Islam leader Louis Farrakhan, Dershowitz warned that the Democratic Party was “tolerating” anti-Semitism. "The Democratic Party isn't anti-Semitic - but they are tolerating anti-Semitism on the hard left part of their base because they don't want to alienate their base. So Keith Ellison gets elected Deputy Chairman of the Democratic National Party. And he had close associations with Farrakhan and falsely denied them,” Dershowitz said in an interview with Fox News on Saturday. Dershowitz said that the party had failed to distance itself from anti-Semitism on its ideological fringes in the same manner the Republican Party had, referencing Bill Clinton’s sharing a stage with Farrakhan at a memorial service for Aretha Franklin this past September. "Bill Clinton...goes to a memorial service, sees Farrakhan there and doesn't leave. Imagine if he had seen David Duke, he'd have gotten up in a minute and leave." "They [Republicans] do a better job. No question. "The Democratic Party has to do a better job. The Republican Party has done a better job in ridding it[self] and condemning the anti-Semites on the hard right. Now the Democratic Party must do a better job of condemning anti-Semites on the hard left. "Many members of the Black Caucus have had associations with Farrakhan. And now we have this newly-elected member of Congress,” Dershowitz said, referring to Ilhan Omar. Dershowitz pointed to a 2012 tweet by Omar, in which she claimed Israel had “hypnotized the world”, and castigated the “evil doings of Israel”. “Israel has hypnotized the world, may Allah awaken the people and help them see the evil doings of Israel,” Omar tweeted. Dershowitz, himself a lifelong Democrat, said the mainstream of the party remained supportive of the Jewish state, but said the election of lawmakers like Omar raised “questions” about the future of his party’s support for Israel. "Israel still is bipartisan among mainstream Democrats, but when you elect people to Congress who have very strong anti-Israel views, it begins to raise questions about whether bipartisanism remain in the future."